Babbling water is one of the most relaxing sounds. 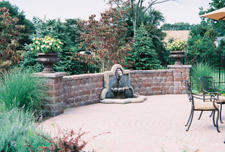 A small pond with a fountain or a larger pond with a waterfall can be a great feature in any yard. Small for just the sound, or a larger one to support both aquatic plants and fish. We use Aquascape systems that require very little care of maintenance allowing you to simply enjoy their beauty and serenity.